01/05/2016: Added a Lectrolite 7 Inch Combination Pliers. 01/02/2016: Added a Lectrolite C-28 Combination Wrench. 12/31/2015: Added a Lectrolite MB-1618 Short Offset Box-End Wrench. 12/28/2015: Added a Lectrolite Defiance 3003 Offset Box-End Wrench. 12/26/2015: Added a Lectrolite O-1922 Open-End Wrench. 12/22/2015: Added a Lectrolite "Tru-Fit" 2216 Combination Wrench. 12/19/2015: Renumbered figures, added a Lectrolite 1916 "Tru-Fit" 9/16 Combination Wrench. 06/07/2011: Added a Lectrolite "Tru-Fit" 2116 Combination Wrench. 06/01/2011: Added a Lectrolite "Chrome Vanadium Steel" 3/4x25/32 Box Wrench. 05/28/2011: Added a Lectrolite "Tru-Fit" 3016 Combination Wrench. 05/19/2011: Added a Tru-Fit 3/4x25/32 Offset Box-End Wrench. 06/02/2010: Added a Lectrolite B-2628 Offset Box-End Wrench. 09/01/2009: Added a Lectrolite 3/4x25/32 Panelled Box-End Wrench. 06/05/2009: Added a Tru-Fit 9/16 Panelled Combination Wrench. 05/10/2009: Added a Lectrolite CV 3004 Offset Box Wrench. 04/26/2009: Added a Lectrolite "Tru-Fit" 11/16x34 Panelled Open-End Wrench. 04/11/2009: Added a Lectrolite "Tru-Fit" 3004 Offset Box Wrench. 04/08/2009: Added a Tru-Fit 11/16x3/4 Panelled Open-End Wrench. 03/31/2009: Added a Lectrolite "Tru-Fit" 3001 Offset Box Wrench. 03/25/2009: Added a Lectrolite "Tru-Fit" 3005 Offset Box Wrench. 03/22/2009: Added a Lectrolite "Tru-Fit" 3006 Offset Box Wrench. 03/20/2009: Added a Lectrolite "Tru-Fit" 3005 Offset Box Wrench. 03/15/2009: Added a Lectrolite "Tru-Fit" 3004 Offset Box Wrench. 10/01/2007: Added a Lectrolite "Lectromium" Tappet Wrench. 04/07/2007: Added a Lectrolite Chrome-Vanadium Tappet Wrench. 01/04/2007: Added a Lectrolite 8002 Tappet Wrench. 11/10/2006: Added a Lectrolite 3003 Offset Box Wrench. The Lectrolite Corporation of Defiance, Ohio was closely associated with S-K Tools during the 1950s and 1960s, but operated independently in the 1930s and 1940s. Although we haven't been able to find much information about the company's early operations, we recently made a discovery (during an online Google search) that provided surprising information on the company's founding. Various public documents and news archives have allowed us to piece together some of the early history of Lectrolite. The Lectrolite Corporation operated in Defiance, Ohio, and the company was known to have been run by Harold L. Schlosser during the 1930s, as his name appears on patent documents with assignment to Lectrolite, and his son William F. Schlosser was president of Lectrolite during the 1950s. Recently an online search turned up several articles that outline the founding of the Lectrolite Corporation. An article on page 8 of Automotive Industries (published by the Chilton Company as v.67 1932 Jul-Dec) bears the caption "Schlosser Heads Auto Parts Merger" with the dateline October 4, 1932. The brief article notes that Harold L. Schlosser, previously of the Monroe Auto Equipment Company, would be working on the merger of The Milwaukee Tool & Forge Company with the Pressed Products Company of Napoleon, Ohio and the Saturn Electric Water Heater Company of Bryan, Ohio. The article reports that the combined companies would produce automotive parts, hardware, and water heaters. The merger of the three companies is also reported in a separate article on page 5 of the same Automotive Industries publication. The three-way merger is confirmed separately by an article in The New York Times for September 28, 1932, entitled "MILWAUKEE TOOL MERGES". The article reports an announcement by a citizens' committee of Defiance, Ohio of the merger of the Milwaukee Tool & Forge Company, Pressed Products Company, and the Saturn Electric Water Heater Company. The merged companies planned to set up operations in Defiance, presumably the goal of the citizens' committee. Although these sources do not mention the name "Lectrolite" -- possibly the company name had not yet been decided -- the association with Schlosser and the Defiance location provide positive identification. Other online sources have shown that Lectrolite used a brand name "Saturn" during the 1930s. In addition, Lectrolite used the brand name "TruFit" (or "Tru-Fit") for some of its tools, and this can now be seen as a variant of the "True-Fit" brand long used by Milwaukee Tool & Forge. Readers interested in further information can refer to our article on Milwaukee Tool & Forge for examples of their tools. The discovery of the connection between Milwaukee Tool & Forge and the Lectrolite Corporation has provided a very satisfying conclusion to two long-running mysteries here at Alloy Artifacts. The first concerned the fate of Milwaukee Tool & Forge, a very successful company in the 1920s that just seemed to disappear; and the second mystery was regarding the origin of the Lectrolite Corporation itself. Having solved the puzzle of the formation of Lectrolite, we now face the more difficult puzzle of trying to figure out the early operations of the company without any catalogs or advertisements to guide us. Since we don't have any information to report yet, we'll just leave some white space and hope to fill it in later. In the early 1950s Lectrolite began a long association with the Sherman-Klove (S-K) Company of Chicago. S-K was well known as a producer of socket sets and tool boxes, but relied on contract production for wrenches and other drop-forged tools. With complementary production capabilities, Lectrolite and S-K made natural business partners. By the early 1950s Lectrolite's wrench production was much more refined than the examples of the 1930s and early 1940s. A catalog from 1951 shows wrenches in open-end, box, and combination styles, all with raised panels and polished chrome finishes. Some of Lectrolite's offset box wrenches of this era resemble the S-K marked wrenches, suggesting that Lectrolite may have done contract production for S-K's in the late 1940s. Lectrolite's association with S-K appears to have been a joint marketing arrangement rather than an actual business merger. Lectrolite filed a trademark for "S-K Lectrolite" with the first use date reported as June of 1953, and later in the 1950s the companies published joint S-K/Lectrolite catalogs. In addition, Lectrolite began marking wrenches with "S-K Lectrolite". In some ways the S-K/Lectrolite co-marketing arrangement resembled the Blackhawk-Armstrong collaboration that began in the late 1920s. In 1962 S-K and Lectrolite were acquired by the Symington-Wayne Corporation, and the combined operations sold tools under the "S-K Wayne" trademark. Later in the 1960s the S-K Wayne operations were purchased by Dresser Industries, an industrial conglomerate. Tru-Fit [logo] 01/01/1917 04/09/1951 09/08/1953 579,565 Tru-Fit with calipers logo. Tru-Fit 03/01/1921 09/18/1947 02/06/1951 537,194 Used for wrenches and pliers. 01/01/1932 04/09/1951 12/02/1951 567,405 Used for wrenches, pliers, other tools. S-K Lectrolite 06/01/1953 11/23/1953 11/22/1955 616,501 Used for wrenches, pliers, other tools. Currently we have only limited catalog resources for Lectrolite, consisting of one catalog from 1951, plus a combined S-K/Lectrolite publication from 1957. One group of early Lectrolite tools can be identified by markings for both the company name and the Defiance, Ohio location. The tools in this group often carry a marking for alloy steel as well, suggesting that these were the higher grade of early Lectrolite production. Lectrolite's early tools typically had rough finishes, often with jagged edges remaining from the post-forging trimming operation. Fig. 1. Lectrolite Lectromium 1/2x9/16 Tappet Wrench, with Inset for Reverse Detail, ca. 1930s. Fig. 1 shows a Lectrolite 1/2x9/16 tappet wrench, stamped "Lectrolite Corp." and "Defiance, O." on one side, with "Lectromium" on the reverse. The overall length is 8.0 inches, and the finish is cadmium plating. The "Lectromium" marking was previously unknown before this example was found. It suggests an alloy steel composition, perhaps as a reaction to the Armaloy, Barcaloy, Bonaloy, etc. markings on competitors' products. Fig. 1B. Lectrolite 5/8x11/16 Tappet Wrench, with Inset for Reverse Detail, ca. 1930s. Fig. 1B shows a Lectrolite 5/8x11/16 tappet wrench, marked "Made in U.S.A." in raised letters, with ".05 Chrome .05 Vanadium" on the reverse. The reverse marking is apparently giving the composition of the chrome-vanadium alloy used for this wrench, a marking not often seen on tools. The Lectrolite Defiance tools included a series of offset box wrenches in a 300x model series, typically marked with "Chrome Vanadium Steel". The next two figures show examples of the Lectrolite 3003 model, with differences noted in the construction. Fig. 2. Lectrolite 3003 "Chrome Vanadium Steel" 5/8x11/16 Offset Box Wrench, with Insets for Side View and Reverse Detail, ca. 1930s. Fig. 2 shows a Lectrolite 3003 5/8x11/16 offset box-end wrench, marked with "Chrome Vanadium Steel" and the model number forged into the shank, with "Lectrolite Corp" and "Defiance O" and the fractional sizes forged into the reverse. 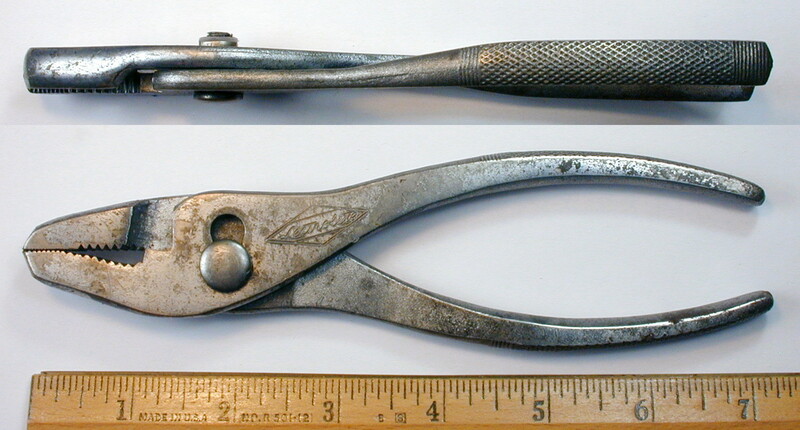 This example is a less common variant of the Lectrolite Defiance box wrenches, without the depressed panels on the shank. Fig. 3. Lectrolite 3003 "Chrome Vanadium Steel" 5/8x11/16 Offset Box Wrench, with Insets for Side View and Reverse Detail, ca. 1930s. Fig. 3 shows another Lectrolite 3003 5/8x11/16 offset box-end wrench with depressed panels, marked with "Lectrolite Corp." and "Defiance O." and the fractional sizes forged into the front panel, with "Chrome Vanadium Steel" and the model number forged into the reverse. Fig. 4. Lectrolite 3004 "Chrome Vanadium Steel" 3/4x25/32 Offset Box Wrench, with Insets for Side View and Reverse Detail. Fig. 4 shows a Lectrolite 3004 3/4x25/32 offset box-end wrench with depressed panels, marked with "Chrome Vanadium Steel" and the model number forged into the front panel, with "Lectrolite Corp." and "Defiance O." and the fractional sizes forged into the reverse. The overall length is 11.1 inches, and the finish is chrome plating, with losses due to wear and rust. Fig. 5. Lectrolite "Chrome Vanadium Steel" 3/4x25/32 Box Wrench, with Insets for Side View and Reverse Detail, ca. 1930s. Fig. 5 shows a Lectrolite 3/4x25/32 box-end wrench with depressed panels, marked with "Lectrolite Corp." and "Defiance O." forged into the front panel, with "Chrome Vanadium Steel" and the fractional sizes forged into the reverse panel. The overall length is 7.3 inches, and the finish is chrome plating, with extensive losses due to rust and pitting. Lectrolite appears to have decided to use the "Tru-Fit" trademark for economy-grade tools from early on. Initially these tools were marked with both the company name and Tru-Fit, but the later economy line carried only the Tru-Fit name. To establish some consistency in our indexing, we will classify any tool with a "Tru-Fit" (or "TruFit") marking as the Tru-Fit brand, regardless of whether the Lectrolite name is also marked. Lectrolite's early tools typically had rough finishes, often with jagged edges remaining from the post-forging trimming operation. In addition, the early Tru-Fit tools show a wide variation in designs and marking, sometimes with raised panels, sometimes with depressed, sometimes with forged-in markings, sometimes with stamped, and so on. Fig. 7. Lectrolite Tru-Fit 8002 5/8x11/16 Tappet Wrench, with Inset for Reverse Detail. Fig. 7 shows a Lectrolite "Tru-Fit" 8002 5/8x11/16 tappet wrench, marked with "Lectrolite" and "Made in U.S.A." plus the fractional sizes forged into the shank, with "Tru-Fit 8002" forged into the reverse. Probably the most commonly found early Tru-Fit wrenches are the deep offset box wrenches in the 3001-3006 series. These wrenches are puzzling for their wide range of production details, as well as the fact that the 300x model numbers collide with those of Lectrolite's alloy-steel "Defiance" wrenches. Normally a company would not produce economy-grade wrenches with the same model numbers as their higher-quality products, as this would cause confusion and degrade the reputation of the better products. These anomalies can be easily explained with the hypothesis that the Tru-Fit 300x series are actually wartime production. With production quotas to meet, Lectrolite may have found it expedient to just re-use the forging dies from the Defiance 300x series, with enough changes to the markings to make them distinct. Unless we find evidence to the contrary, we will assume that the Tru-Fit 300x series are wartime production from 1941-1945. Fig. 8. Lectrolite 3001 "Tru-Fit" 3/8x7/16 Offset Box Wrench, with Insets for Side View and Reverse Detail, ca. 1941-1945. Fig. 8 shows a Lectrolite 3001 "Tru-Fit" 3/8x7/16 offset box-end wrench with raised panels, stamped "Lectrolite" on the panel with "Made in U.S.A." forged into the shank. The reverse is stamped with "Tru-Fit" and the model number on the panel, with the fractional sizes forged into the shank. The overall length is 7.1 inches, and the finish is cadmium plating. 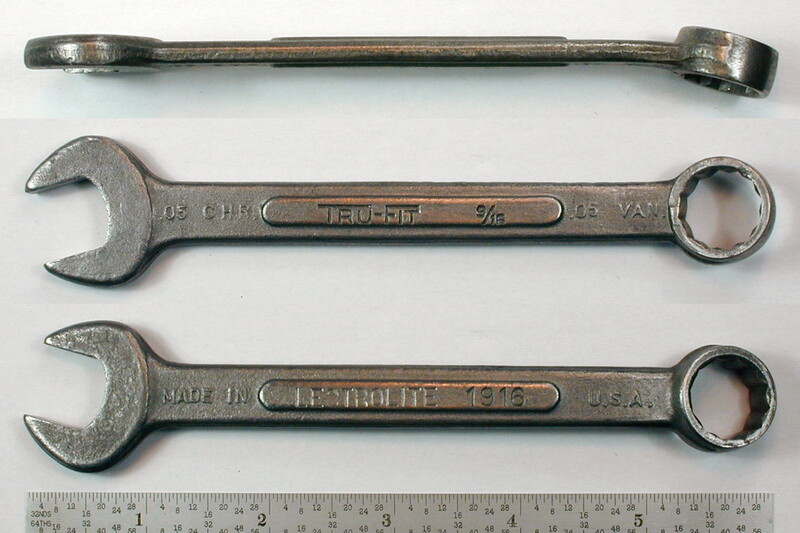 The next two figures show examples of the model 3004 box wrench, with minor differences in the markings. Fig. 9. Lectrolite 3004 "Tru-Fit" 3/4x25/32 Offset Box Wrench, with Insets for Side View and Reverse Detail, ca. 1941-1945. Fig. 9 shows a Lectrolite 3004 "Tru-Fit" 3/4x25/32 offset box-end wrench with raised panels, marked with "Tru-Fit" and the model number forged into the front panel, with "Lectrolite" forged into the reverse panel. The shank is also marked with "Made in U.S.A." forged into the front, with the fractional sizes forged into the reverse. The overall length is 11.2 inches, and the finish is cadmium plating. Fig. 10. Lectrolite 3004 "Tru-Fit" 3/4x25/32 Offset Box Wrench, with Insets for Side View and Reverse Detail, ca. 1941-1945. Fig. 10 shows another Lectrolite 3004 "Tru-Fit" 3/4x25/32 offset box wrench, very similar to the previous example, but with the markings on the opposite sides. The front is marked with "Lectrolite" and the fractional sizes forged into the shank, with "Tru-Fit" and "Made in U.S.A." forged into the reverse. The next figures show two generations of the Tru-Fit model 3005 wrench. Fig. 11. Lectrolite 3005 "Tru-Fit" 13/16x7/8 Offset Box Wrench, with Insets for Side View and Reverse Detail, ca. 1941-1945. Fig. 11 shows a Lectrolite "Tru-Fit" 3005 13/16x7/8 offset box-end wrench with depressed panels on the shank. The shank is marked with "Tru-Fit" and "Made in U.S.A." forged into the front panel, with "Lectrolite" and the fractional sizes forged into the reverse. The overall length is 13.0 inches, and the finish is cadmium plating. Fig. 12. Lectrolite 3005 "Tru-Fit" 13/16x7/8 Offset Box Wrench, with Insets for Side View and Reverse Detail, ca. 1945 to Late 1940s. Fig. 12 shows a later Lectrolite 3005 "Tru-Fit" 13/16x7/8 offset box-end wrench with depressed panels, marked with "Tru-Fit" and "Made in U.S.A." forged into the front panel, with "Lectrolite" and the fractional sizes forged into the reverse panel. The overall length is 12.6 inches, and the finish is chrome plating. The chrome plating on this example suggests post-war production. Fig. 13. Lectrolite 3006 "Tru-Fit" 15/16x1 Offset Box Wrench, with Insets for Side View and Reverse Detail, ca. 1941-1945. Fig. 13 shows a Lectrolite 3006 "Tru-Fit" 15/16x1 offset box-end wrench with raised panels, marked with "Tru-Fit" and "Made in U.S.A." forged into the shank, with "Lectrolite" and the fractional sizes forged into the reverse. The overall length is 14.3 inches, and the finish is cadmium plating. Fig. 14. Lectrolite 3/4x25/32 Panelled Box-End Wrench, with Insets for Side View and Reverse Detail. Fig. 14 shows a Lectrolite 3/4x25/32 box-end wrench with depressed panels, marked with "Lectrolite" and the fractional sizes forged into the front panel, with "Made in U.S.A." forged into the reverse panel. The overall length is 7.2 inches, and the finish is cadmium plating. Lectrolite's early Tru-Fit combination wrenches were given model numbers that can only be described as bizarre, with no seeming pattern or progression of model numbers with the corresponding size. For a while we thought that we just needed to find a few more examples to figure out the numbering, but now it seems that each additional wrench just brings more confusion. Fig. 15. Lectrolite 1916 "Tru-Fit" 9/16 Combination Wrench, with Insets for Reverse and Side View, ca. 1930s. Fig. 15 shows a Lectrolite "Tru-Fit" 1916 9/16 combination wrench with raised panels, stamped with "Tru-Fit" and the fractional size on the front panel, with "Lectrolite" and the model number on the reverse panel. The shank also has ".05 Chr" and ".05 Van" forged into the front, with "Made in U.S.A." forged into the reverse. Fig. 16. Lectrolite "Tru-Fit" 3016 5/8 Combination Wrench, with Insets for Side View and Reverse Detailr, ca. 1930s. Fig. 16 shows a Lectrolite "Tru-Fit" 3016 5/8 combination wrench with raised panels, stamped with "Tru-Fit" and the fractional size on the front panel, with "Lectrolite" and the model number on the reverse panel. The reverse is also marked with "Made in U.S.A." forged into the shank. The overall length is 6.9 inches, and the finish is cadmium plating. Fig. 17. Lectrolite "Tru-Fit" 2116 11/16 Combination Wrench, with Insets for Side View and Reverse Detail, ca. 1930s. Fig. 17 shows a Lectrolite "Tru-Fit" 2116 11/16 combination wrench with raised panels, marked with "Tru-Fit" and the fractional size forged into the front panel, with "Lectrolite" and the model number forged into the reverse panel. The reverse is also marked with "Made in U.S.A." forged into the shank. The overall length is 7.9 inches, and the finish is cadmium plating. Fig. 18. Lectrolite "Tru-Fit" 2216 11/16 Combination Wrench, with Insets for Side View and Reverse Detail, ca. 1930s. Fig. 18 shows a Lectrolite "Tru-Fit" 2216 3/4 combination wrench with depressed panels, marked with the fractional size and "Tru-Fit" forged into the front panel, with the model number and "Lectrolite" forged into the reverse panel. The reverse is also marked with "Made in U.S.A." forged into the shank. During the early 1950s Lectrolite and Sherman-Klove (S-K) began a marketing collaboration that included publishing a combined catalog showing both company's tools. In addition, some production (particularly wrenches) was marked with both the "S-K" and "Lectrolite" names. Lectrolite filed a trademark for "S-K Lectrolite" and listed the first use date as June of 1953. Lectrolite's production during this era showed much greater refinement, with ground and polished chrome-plated finishes. In addition, tools were given "rational" model numbers consisting of a mnemonic prefix followed by a number indicating the opening sizes in 32nds. In this section we'll look first at some of Lectrolite's tools from the late 1940s to early 1950s, and then proceed to the dual-branded S-K/Lectrolite tools. Finally, we may show a few S-K Wayne examples just for context. Fig. 19. Lectrolite 7 Inch Combination Pliers, with Inset for Side View, ca. Late 1940s to Early 1950s. Fig. 19 shows a pair of Lectrolite 7 inch "universal" combination piers, stamped with the "Lectrolite" logo near the pivot. The top inset shows a side view of the pliers, illustrating the diamond checkered gripping surface. Fig. 20A. Lectrolite O-1922 19/32x11/16 Open-End Wrench, with Inset for Reverse, ca. Late 1940s to Early 1950s. Fig. 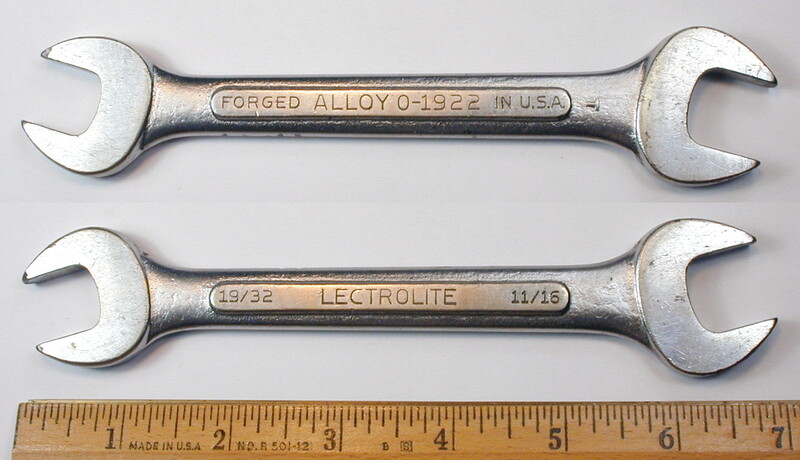 20A shows a Lectrolite O-1922 19/32x11/16 open-end wrench with raised panels, stamped with "Lectrolite" and the fractional sizes on the front panel, with "Alloy" and "Forged in U.S.A." on the reverse panel. The reverse shank also has a forged-in "T" code visible at the right. The overall length is 6.8 inches, and the finish is chrome plating. Fig. 20B. Lectrolite B-2628 13/16x7/8 Offset Box Wrench, with Insets for Side View and Reverse Detail, ca. Late 1940s to Early 1950s. Fig. 20B shows a Lectrolite B-2628 13/16x7/8 offset box-end wrench with raised panels, stamped "Alloy" and "Forged in U.S.A." on the front panel, with "Lectrolite" and the fractional sizes on the reverse panel (see lower inset). Fig. 21. Lectrolite MB-1618 1/2x9/16 Short Offset Box Wrench, with Insets for Side View and Reverse Detail, ca. Late 1940s to Early 1950s. Fig. 21 shows a Lectrolite MB-1618 1/2x9/16 short offset box-end wrench with raised panels, stamped with "Lectrolite" and the fractional sizes on the front panel, with the model number and fractional sizes on the reverse panel. The shank also has a forged-in "K" code visible to the left of the panel. The overall length is 5.7 inches, and the finish is chrome plating. Fig. 22. Lectrolite C-28 7/8 Combination Wrench, with Insets for Side View and Reverse Detail, ca. Late 1940s to Early 1950s. Fig. 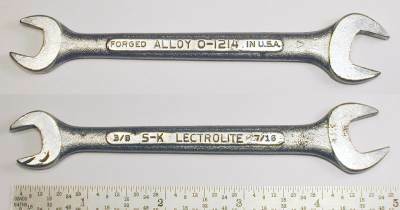 22 shows a Lectrolite C-28 7/8 combination wrench with raised panels, stamped with "Lectrolite" and the model and fractional size on the front panel, with "Alloy" and "Forged in U.S.A." on the reverse panel. The reverse shank also has a forged-in "Z" code visible to the left of the panel. The overall length is 11.1 inches, and the finish is chrome plating. Fig. 23. S-K Lectrolite O-1214 3/8x7/16 Open-End Wrench, with Inset for Reverse, ca. 1953 to Early 1960s. Fig. 23 shows an S-K Lectrolite O-1214 3/8x7/16 open-end wrench with raised panels, stamped "S-K Lectrolite" with the fractional sizes on the front panel, with "Alloy" and "Forged in U.S.A." on the reverse panel. Fig. 24. S-K Lectrolite O-2526 25/32x13/16 Open-End Wrench, with Inset for Reverse, ca. 1953 to Early 1960s. Fig. 24 shows an S-K Lectrolite O-2526 25/32x13/16 open-end wrench with raised panels, stamped "S-K Lectrolite" with the fractional sizes on the front panel, with "Alloy" and "Forged in U.S.A." on the reverse panel. The overall length is 8.9 inches, and the finish is chrome plating, with extensive losses due to rust. By the late 1940s or early 1950s Lectrolite had begun using the Tru-Fit brand by itself for a line of economy tools, with wrenches available in open-end, box-end, and combination styles. The wrench design featured shanks with gently-sloped oval depressed panels, similar to the Vlchek "Panel-Bar" wrenches or the "Penens-Chicago" wrenches of the 1950s. Earlier economy wrenches had been marked with the Lectrolite company name, or with both Lectrolite and Tru-Fit, but this later production was marked with only the Tru-Fit brand. Fig. 25. TruFit 3/4x25/32 Offset Box-End Wrench, with Insets for Side View and Reverse Detail, ca. 1950s. Fig. 25 shows a TruFit 3/4x25/32 offset box wrench depressed panels, marked with the TruFit logo and "Made in U.S.A." forged into the front panel, with "Forged Steel" and the fractional sizes forged into the reverse panel. The front panel also has a forged-in "R" code at the left. The overall length is 10.8 inches, and the finish is plain steel, with possible traces of cadmium plating. The next two figures show examples of TruFit panelled wrenches in the 11/16x3/4 size. Fig. 26. Lectrolite "TruFit" 11/16x3/4 Open-End Wrench, with Inset for Reverse Detail, ca. Late 1940s. Fig. 26 shows an earlier Lectrolite "TruFit" 11/16x3/4 open-end wrench with oval depressed panels, marked with the TruFit logo and "Forged in U.S.A." forged into the shank, with "Lectrolite" and the fractional sizes forged into the reverse. Fig. 27. TruFit 11/16x3/4 Panelled Open-End Wrench, with Inset for Reverse Detail, ca. 1950s. Fig. 27 shows a later TruFit 11/16x3/4 open-end wrench, marked with the TruFit logo and "Made in U.S.A." forged into the shank, with "Forged Steel" and the fractional sizes forged into the reverse. Fig. 28. TruFit 9/16 Panelled Combination Wrench, with Insets for Side View and Reverse Detail, ca. 1950s. Fig. 28 shows a later TruFit 9/16 combination wrench with depressed panels, marked with the TruFit logo and "Made in U.S.A." forged into the front panel, with "Forged Steel" and the fractional size forged into the reverse. The front panel also has a forged-in "H" code at the left.